Thank you for 6 great years. We are sad to announce that The Bellevue Farmers Market will not be returning for the 2019 season. We have a so many great memories with our #FridayNightFamily over the last few years. We are thankful for Elizabeth Spinelli starting the market in 2013. When we took the market over in 2014, we tried to honor her vision and continue to grow the market. We are also thankful for the Bellevue United Methodist Church for giving us a home for the first two and half years. The church and immediate community gave us a lot of love and support. Halfway through the 2015 season, with the help of the downtown Nashville Farmers Market, we moved to Red Caboose Park, in an attempt to better serve the community. The community supported us beyond belief and we met several new faces. We had a great few years. Then the changes at the park in spring of 2018, proved to be too much of a challenge. Those challenges have carried over to the 2019 season. Our goal is to restructure and return in 2020. Until we see you again, we hope you will take advantage of a very special thing happening right here in Bellevue - the S.E. Daugherty & Sons farm stand located at the 70/70S split in Bellevue. Shaun and his family work incredibly hard to provide quality food for Nashville and they deserve our support. Visit their website for more details. 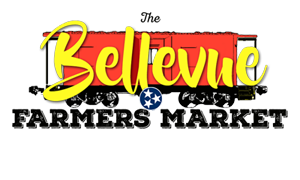 Thank you again for your support, Bellevue. We hope to see you again soon.